What is central ray entry? Central ray entry is where the PID/cone is centered on the patient. While this may seem to be the easiest thing to do, central ray entry errors are very common. There really is only one central ray entry error and that is when the PID is not centered over the film or sensor creating an area of the film or sensor that is not exposed to x rays. This leads to the dreaded ‘cone cut’ where there is no information recorded but merely a white area. Those who use rectangular collimation will see this as a white area with straight edges. Those who use round collimation will see a white area with a curved edge. Now that you’ve had a chance to refresh your horizontal and vertical angle positioning on radiographs, make sure it doesn’t all go to waste by not ensuring the PID is centered over the film or sensor. If you are using the XCP instruments or similar instruments, it is important to not only center the PID in the ring, but to also make sure that the PID is parallel with the rod in both the horizontal and vertical angles. A PID that is not parallel with either the horizontal or vertical angles (as shown by the rod) but centered in the ring can still create a ‘cone cut’. 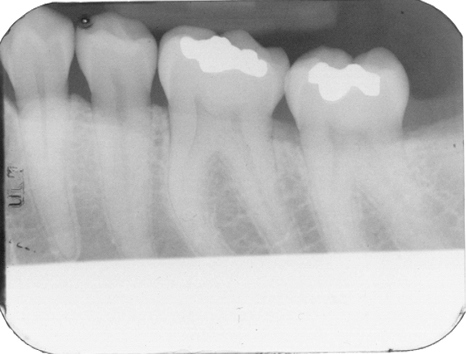 I hope these short points on radiographic technique have helped improve or refresh your skills in making radiographs.